Dr G.N.Saibaba Professor at Delhi University and now in solitary confinement in Nagpur Central Jail has spoken out for help. 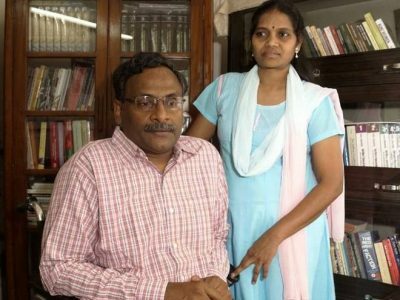 Saibaba 90 per cent disabled and suffering from multiple ailments, wrote this letter to his wife Vasantha that he might not be able to survive the winter months in jail. He has been convicted under the Unlawful Activities (Prevention) Act in what those convinced of his innocence describe as a travesty of justice. Saibaba has been branded a Maoist and sentenced to life imprisonment. A sessions court in Gadchiroli district of Maharashtra had convicted Saibaba in March for Maoist links and sentenced him to life imprisonment. Professor Saibaba, Mr. Mishra, Mr. Rahi and two residents of Gadchiroli —Mahesh Tirki, Pandu Narote — were convicted under Sections 13, 18, 20, 38 and 39 of the Unlawful Activities (Prevention) Act (UAPA) and Section 120 B of the Indian Penal Code for connections with the banned Revolutionary Democratic Front (RDF), an organisation linked with the banned Communist Party of India (Maoist). The letter was written on October 17 and received by his wife on October 25. I am frightened to think of coming winter. Already I am shivering with continuous fever. I do not have a blanket. I do not have a sweater/jacket. As temperature goes down excruciating pain continuously in my legs and left hand increases. It is impossible for me to survive here during the winter that starts from November. I am living here like an animal taking its last breaths. Somehow 8 months I managed to survive. But I am not going to survive in the coming winter. I am sure. It is of no use to write about my health any longer. You should talk to Mrs Rebeccaji and Nandita Narain. You also talk to Prof. Haragopal and others. Explain the entire situation. You need to hurry up. I am feeling so depressed for requesting you all so many times like a beggar, a destitute. But none of you are moving an inch, no one understand my present condition. No one understands 90% disabled person is behind bars struggling with one hand in condition and suffering with multiple ailments. And no one cares for my life. This is simply criminal negligence, a callous attitude.